Our office is located at 128 Grant Avenue, Suite 114 in Santa Fe NM. Explore the area and get directions to one of our Santa Fe vacation rental properties using the map below. If you would like to know more about Santa Fe including our history, markets and festivals click here. Be a part of the history, romance and intrigue that has made Santa Fe famous! We offer various relaxing vacation homes to rent in downtown Santa Fe near the Plaza, Canyon Road & The Railyard District. 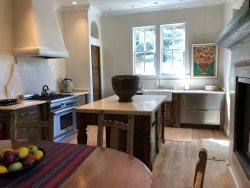 We are one of the oldest firms in Santa Fe specializing in exclusive short term and long term Santa Fe Vacation Rentals.